Background Depression in pregnancy is commonly treated using selective serotonin reuptake inhibitors (SSRIs). A possible withdrawal syndrome following in utero exposure has been reported, but there is currently no UK guidance on the management of these neonates. Methods All 160 neonatal units in England were asked for information regarding their management of SSRI-exposed babies. Results Responses were obtained from 112/160 (70%) units. Only four units had a specific protocol for managing SSRI-exposed neonates. Twenty-one units (19%) conduct routine observations on exposed neonates, while 37 units (33%) would consider treating babies with signs of withdrawal or toxicity. Conclusions Very few neonatal units in England have specific guidelines for the management of babies exposed to SSRIs in utero, with practice varying greatly between units. Further research is needed on the outcomes of SSRI-exposed babies to support development of standardised evidence-based guidelines to ensure all mothers and babies receive similar high-quality care. Antenatal depression affects up to 1 in 8 pregnancies, and selective serotonin reuptake inhibitors (SSRIs) are commonly prescribed for affected women. Some babies exposed to SSRIs in utero can display a form of withdrawal syndrome during the newborn period. There is currently no UK national guideline as to the management of SSRI-exposed babies. Very few neonatal units in England have a protocol for managing selective serotonin reuptake inhibitor (SSRI)-exposed babies. There is wide variation across England in the periods of observation required for SSRI-exposed babies. Treatment of SSRI-exposed babies displaying withdrawal symptoms varies widely between different neonatal units in England. Depression in pregnancy is a significant clinical problem, with estimates of prevalence up to 13.5% in the third trimester.1 The British National Formulary (BNF) makes no specific recommendations as to which antidepressants should be prescribed for pregnant women. However, in clinical practice, selective serotonin reuptake inhibitors (SSRIs) are the most commonly prescribed with an estimated 1.8%–2.8% of pregnancies being exposed.2 This translates to more than 12 000 babies born each year within England and Wales. A 2012 study in the Netherlands demonstrated variation in practice across the country in postnatal care for neonates born following in utero SSRI exposure.9 This study sought to assess current practice in England with regard to the management of babies exposed to SSRIs in utero. All 160 neonatal units in England (not including neonatal surgical units) were contacted to request details as to their management of babies exposed to SSRIs during pregnancy. Units were initially contacted by email (to the unit’s Clinical Lead) and sent a short questionnaire (table 1), with those who failed to respond contacted by telephone. Units who did have a written guideline on the management of neonates exposed to SSRIs in utero were asked to forward a copy of this. indications for treatment and recommended treatment. Twenty-one units (19%) reported that they carry out routine observations on SSRI-exposed babies, with periods of observation up to 48 hours. 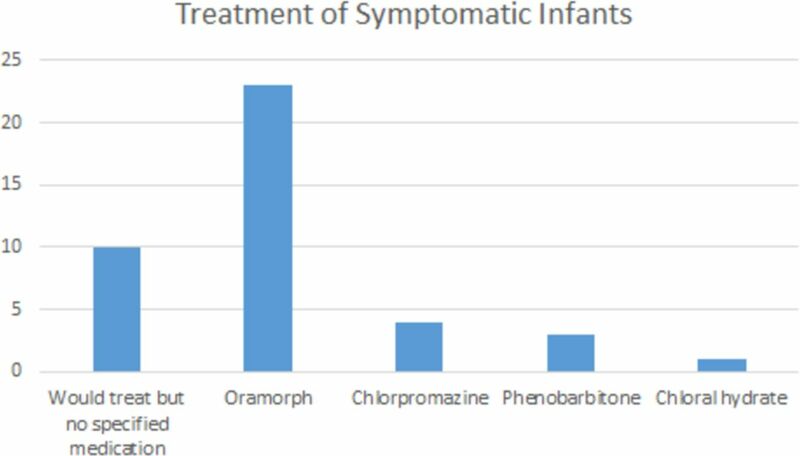 Thirty-seven units (33%) reported that they would consider treating symptomatic babies, with 27 of these suggesting specific medication(s) (figure 1). Treatments used for symptomatic infants. This study has demonstrated variation in the length of routine observations (if any) carried out on SSRI-exposed babies. It is therefore possible that either some units are not adequately assessing exposed babies and may miss important signs and symptoms, or that in some units babies are being kept unnecessarily in hospital for prolonged periods of observation. Estimates of the prevalence of neonatal symptoms in the literature vary, possibly reflecting differences in length of exposure and individual SSRIs used between studies.4 5 The Canadian Paediatric Society advocate for a 48 hours period of hospital observation for all babies with third trimester exposure to SSRIs,7 with a review article from the Netherlands taking a similar stance while also acknowledging that in the majority of cases any neonatal symptoms are mild and self-limiting.13 Maternal health and well-being may not be best supported by prolonged periods of hospital admission and there is a potential stigma associated with not being able to have an early discharge. There is also ever-increasing pressure on postnatal bed availability in neonatal units across the country. For all these reasons, it is essential that any routine periods of observation are evidence-based, cost-effective and baby-friendly. There was much variation in what treatment, if any, neonatal units reported they would give to a baby withdrawing from SSRIs, likely reflecting the lack of clear evidence supporting any particular pharmacological treatments. There has been uncertainty as to whether SSRI exposure in utero produces a withdrawal syndrome or toxicity,6 with treatment generally aimed at treating symptoms rather than gradual weaning of the causative medication as with opiate withdrawal. There is also some evidence to suggest breastfeeding reduces the risk of developing symptoms.14 More recent studies have suggested potential neurodevelopmental consequences beyond the first few days of life with research demonstrating lower motor scores and increased stress signs throughout the first month of life in babies of mothers treated with SSRIs compared with those with untreated depression.15 Additionally, there is evidence of subtle electroencephalogram changes in neonates exposed to SSRIs in utero compared with healthy controls.16 In both of these studies, potential confounding of maternal depression could not be fully excluded, but this does challenge some units’ focus on the first 24 or 48 hours of life rather than longer term neurodevelopment. A strength of this study is the high response rate, with 70% of neonatal units providing information as to their management of SSRI-exposed babies. The accuracy of the data received relies on the staff members responding having a good knowledge and understanding of their units’ practice with regard to babies exposed to SSRIs. This was mitigated by contacting Clinical Leads in the first instance, and then if unable to get a response, contacting other senior medical or nursing staff. This study has demonstrated wide variation in the management of babies exposed to SSRIs across England and the associated lack of a UK national guideline in this area. This is clearly not a good way to manage a clinical situation affecting thousands of mothers and babies each year. As a neonatal community, we need to seek to better understand the clinical problem posed by SSRI-exposed babies, how we identify babies most at risk and whether any additional observations or treatments affect long-term outcomes. Further research is needed to help answer these questions and enable the development of evidence-based guidelines to support neonatal units and individual clinicians in managing SSRI-exposed babies. We are grateful to all the neonatal units who responded to the questionnaire and provided details about their management of SSRI-exposed babies. National Institute for Health and Care Excellence.Antenatal and postnatal mental health: clinical management and service guideline (CG192).London National Institute for Health and Care Excellence, 2014.
. Neonatal abstinence syndrome: assessment and management. Addict Dis 1975;2:141–58. Contributors ET and PJP designed the study, with advice from SEB. ET collected and analysed the data. ET produced the first draft of this paper, with PJP and SEB contributing to the final version.